An inexpensive and unique way to show your team pride with a bag for each player. Everyone needs a shoe bag and you can customize these bags for your team starting at $8.45 with a minimum purchase of 25 bags. Turnaround time is 3-4 weeks from final art approval. Call us at 1-800-872-7842 to get more information. 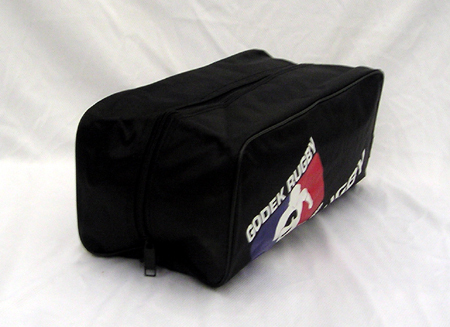 This coated nylon rugby boot bag is large enough (14”x7”x6”) to fit a pair of size 14 high top rugby boots. The bag is water-resistant and is the best way to keep your dirty boots away from the rest of your kit. The bag unzips fully on 3 sides for ease of access to your boots and features a mesh side pocket to store your personal items for easy access, esp. cell phone and mouth guard. The carry strap makes this shoe bag easy to carry. But don’t just use it for shoes. This bag can also be used as a shaving kit or carry all.